Running is something every midfielder knows a lot about but, besides general fitness, midfielders hold a lot of skills and must be able to perform them well. All of this means that they need a serious soccer cleat that can cope with multiple uses. While out there on the pitch trying to keep a good overview on events, midfielders do not want to be worrying about where the ball is. They need to be able to feel it and also keep it under control with a soccer cleat that gives them good touch. One of the most famous midfielders, Xavi Hernandez, is often looked to as a guide. People are always looking to see what he has been wearing and wondering what are the latest Xavi cleats? And, indeed, this man is going to know what works and what doesn’t for when he is out on the pitch. Xavi’s skills notwithstanding, any midfielder worth his or her salt knows that they want a shoe that will allow them to be creative on the pitch whilst maintaining control of the ball. And they need grippy cleats that will not let them down. When comparing soccer cleats for midfielders, it’s important to begin with the usual soccer shoe fitting guidelines and then add in the specific needs of a midfielder. Although there are a lot of great all rounder cleats on the market, a midfielder will have a better experience if he or she aims to purchase a pair of shoes that is more specific to his needs. Nike Men’s Mercurial Victory V Cr Fg Soccer Cleat – These are certainly some of the coolest soccer cleats if you like something that looks a little bit different. They are black with a nebulous, lava-like print on the upper. This is covered by the Nike swoosh. The uppers are trophy touch synthetic leather, keeping the shoe nice and light, and the material provides for a soft touch. The foot is locked down with an internal cage. The TPU outsole runs the full length of the sole providing good, multi-directional grip and acceleration. They tend to run a bit small so order up half a size or, at least, give them a good try before committing. 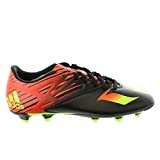 Adidas Performance Men’s Messi 15.3 Soccer Shoe – Another original looking soccer cleat, the Adidas Performance Messi is black with solar red and green designs overlayed. They have a synthetic upper which is designed with the MessiTOUCH X-ray surface. This is to provide precision with each touch. The cleats themselves are placed in a manner so as to provide more flexible traction, a much needed feature for midfielders with all the quick cuts and changes. Although they have a good, snug fit, some may find these shoes a little on the small side. Consider ordering up half a size. A good choice in the lower price range. Nike Men’s Mercurial Victory V Fg Soccer Cleat – The yellow, paint-spattered look on the dark blue background of these shoes make it look like stars in the night sky. The upper is synthetic and all one piece making these cleats lightweight and very easy to keep wiped clean at the end of the match. It is also made of a cloth-type texture to provide for good touch. They have a TPU outsole that runs the length of the shoe and provides great traction. They run a little bit small. The shoe should please most midfielders who play on a firm, natural pitch and are looking for a lower priced boot. Nike Men’s Mercurial Victory V Fg Soccer Cleat – These leather and synthetic shoes are known for their soft, trophy touch which is great for busy midfielders. They also have a contoured sockliner which keeps your feet comfortable and stable. The outsole runs the full length of the shoe and is TPU which provides great, multi-directional traction. Some have found them to run a little bit smaller than average. They come in an amazing array of colors, from yellows to greens to bright oranges, all with varying colors of the Nike swoosh on top. They can be found online for a range of prices, some very low, making this a good shoe for players on a budget. PUMA Men’s Esquadra Firm-Ground Soccer Shoe – This is a nice looking, lower priced shoe from PUMA that checks all the boxes as far as a midfielder’s needs are concerned. The upper is a lightweight synthetic leather that is soft to the touch and it is easy to clean. The outsole is also lightweight polyurethane. The design is sleek and classic and comes in either orange or black with the PUMA formstrips on the outside of the shoe. They are known to run quite small so it is recommended to order up a whole size from your usual size. If you need a lower priced classic, this could be the one. Buyers Guide – What Are The Most Comfortable Soccer Shoes To Wear While You’re Running Box To Box? If you consider the amount of running that occurs for box to box midfielders during a match you are getting into marathon territory. But, on top of the running, you also need to be able to effectively attack, defend, control and pass…at a minimum. There are myriad tasks a midfielder needs to concentrate on without stopping to worry about shoes. Think in two categories. Remaining upright is an essential need for a soccer player and this means traction. In futsal, traction is mainly characterized by flatter rubber outsoles in the shoes that make full contact with the slick playing surface. For traditional soccer, it’s important to know what kind of ground you will be playing on. There are varying types and configurations of cleats depending on the needs of the player so be sure and consider if your grounds are firm or of the softer variety, or even artificial turf, when buying shoes. A good pair of soccer cleats for a midfielder is one that has some sort of textured fabric or other design built in to the upper to create good touch. You need to be able to gain control of the ball and move it on quickly, and that is why you need to not only be able to feel the ball well, but also keep possession without unnecessary anguish. Another way to keep control is to have a pair of soccer cleats that stays in place on your foot. This is why soccer shoes are narrower and more snug than regular sport shoes. Some also have added accoutrements such as a foot cage to hold your foot in place in the boot. Buy wisely. This entry was posted on January 7, 2016 by admin.